The graph shows the income generated for host cities by the Winter Olympic Games between 2002 and 2010 and a prediction for 2014. 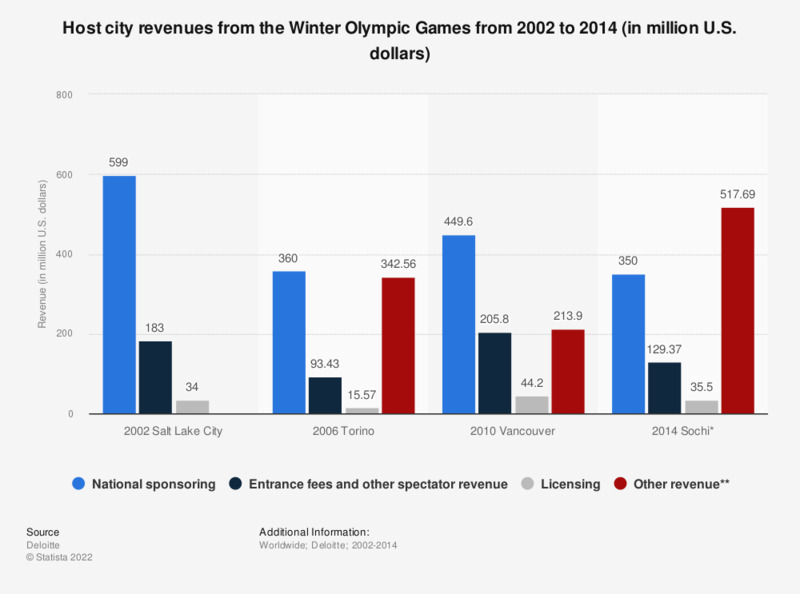 In 2002, Salt Lake City took in 599 million US dollars through national sponsorship. The 2014 Sochi Games are projected to generate almost 350 million US dollars via national sponsorship revenues. ** "Other revenues" include lotteries, donations, sales of assets, subsidies and others. "How important are each of the following metrics to the success of legacies after sporting events?" "Which of the following stakeholders are primarily responsible for the achievement of a positive legacy from a sporting event?"